A tone changing tool for guitarist. 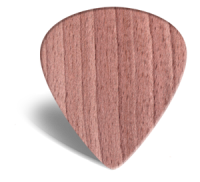 NorwegianWoodPickers is a series of wood and wood/metal guitar picks handcrafted from selected Norwegian woods like Oak, Maple, Ash, Hazelnut, Cherry, Apple & Kebony Maple. Handcrafted with care, enthusiasm and admiration for wood as the perfect material for crafting Fine Tiny Musical Instruments. The picks are crafted specifically to enhance the richness of tone in the guitar. A guitar is usually built with different woods and different metals. Body, neck, fingerboard, rosewood, maple, mahogany, ebony. Bridge, saddle, brass, metal, nut, plastic, bone metal, synthetic bone, strings. Components that individually are part of shaping the unique tone of an instrument. It’s not science as much as it is nature. It’s meant to be that way, just not in the religious sense of the word. Our task is to combine the right components. What we really want is to expand the individual guitarists perception of the guitar pick. 8 shapes based on vintage guitar picks. After hundreds of hours of shaping wood picks we came up with 8 shapes that we believe will satisfy not only most guitar players, but also bass players. 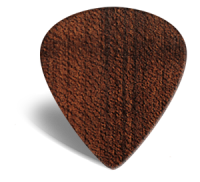 Early in the development stage we noticed the tip of the pick accent the sound. So we listened. Sanded. Listened some more. Sanded some more and so on, to find the ultimate tip. We came up with 4 distinct tips; Blunt, Rounded, Sharp, Carved Edge. Each of these tips accents the tone in different ways like warmth, bass and treble. The All Wood Series comes with a rounded tip. Blunt, Sharp and Carved Edge is available thru The Custom Shop. There is also distinct differences in tone quality with different thickness. Any thickness can be crafted, however, we offer a selection of gauges for all 8 shapes that we believe would suit most guitar players. NorwegianWoodPickers want to give the professional guitarist, electric or acoustic, the option of getting the purest tones possible out of their instrument. We truly believe our line of all wood picks or custom shop wood/metal picks can provide that purity. Kebony is a denser, heavier and harder wood than most trees found in Norway. The invention of the Kebonization process is a Norwegian story 20 years in the making. Kebony is a sustainable alternative to hardwoods from tropical regions. The processed maple resembles teak and other tropical varieties of wood. Kebony Maple produces a brighter tone than Ash or Beech. It wears a little quicker, but for a bedroom guitar player these picks will last for months. For a professional guitarist they might last only one show of rough playing. Less aggressive playing styles can enjoy this pick for 20-30 hours. Beech is the densest wood found in Norwegian woods. The difference between blood beech and regular beech is the wood and bark’s pinkish red colour. It’s a beautiful wood. Blood beech produces a warm tone and wears slow. The density eliminates the feel of the strings hitting the pick between your fingertips. It’s been said that an Oak tree grows for five hundred years, lives for five hundred years, and dies for five hundred years. Oak is a symbol of strength, life force and perseverance. The keel of the Viking ship Gokstad excavated in Norway in 1880 was built of of a straight grown Oak approximately 25 meters (82 feet) in height. The wood was hewn from green logs, by axe and wedge, to produce radial planks, similar to quarter-sawn timber. Oak is very bright in tone and feels superb between the finger due to the wood fiber structure. The wood ages beautifully. The Louiville Sluggers are made from ash. Fender uses ash as guitar bodies. This is a long-fibered wood and we found out that the wear at the tip of the pick is minimal, hard playing actually packs the fibers at the tip before wear occurs. The tone is brighter than blood beech, but not as crisp as Kebony Maple. Wake Up & Smell The BeesWax ! Beeswax was among the first plastics to be used, alongside other natural polymers such as gutta-percha, horn, tortoiseshell, and shellac. Beeswax is a natural wax produced by worker bees in the hive of honey bees of the genus Apis. It is mainly esters of fatty acids and various long-chain alcohols. The honey bees use the beeswax to build honeycomb cells in which their young are raised with honey and pollen cells being capped for storage. When beekeepers extract the honey, they cut off the wax caps from each honeycomb cell with an uncapping knife or machine. Its color varies from nearly white to brownish, but most often a shade of yellow, depending on purity and the type of flowers gathered by the bees. We have experimented with different brands and types of beeswax trying to find the perfect combination of grip and esthetics, and we believe we nailed it. Each NorwegianWoodPickers wood or wood metal pick bought with a wood freight crate comes with a vintage worn cloth with beeswax.